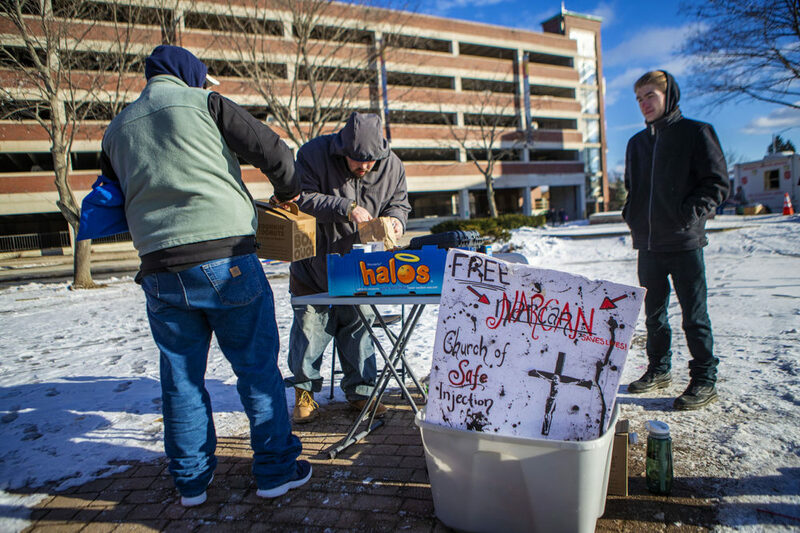 On a bitter cold recent afternoon — in front of the central bus stop in Bangor, Maine — about a half dozen people surrounded a folding table covered with handmade signs offering free clean syringes, coffee, safe drug-injecting supplies and Narcan, the most common brand of the drug naloxone that reverses an opioid overdose. They're with a group called the Church of Safe Injection and they say their gospel is harm reduction, helping people use drugs safely and creating a community of people who are often at the margins of society. "Each church articulates its own principles and ideas about faith," said a volunteer who goes by the name Dave Carvagio, though it's not his real name. "We do draw a lot on the gospel of the poor from Christianity because we do believe that Jesus of Nazareth was a radical and believed in compassion toward what's referred to in the Bible as 'the least among us.' 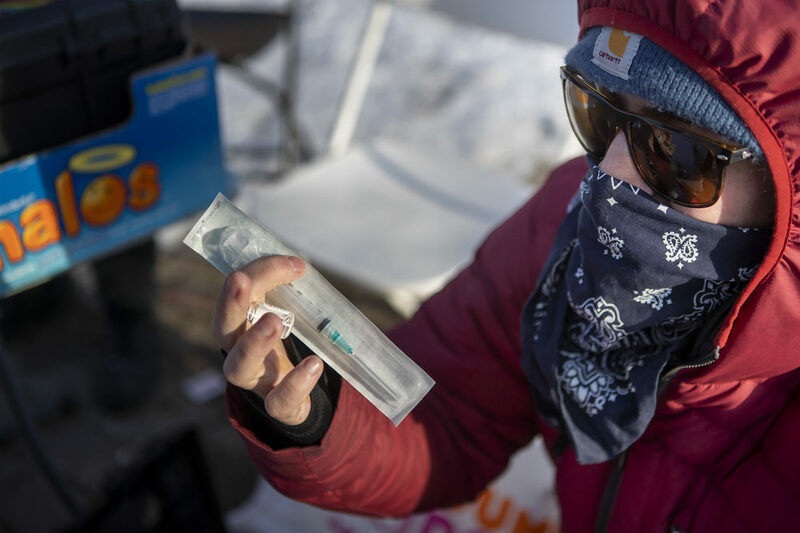 "
Carvagio doesn't want to be identified because it's illegal in Maine to have more than 10 hypodermic syringes unless you're a certified needle exchange. He and the other volunteers say they're willing to risk arrest to do this because they say thousands of people are dying of overdoses because the public health system has failed. 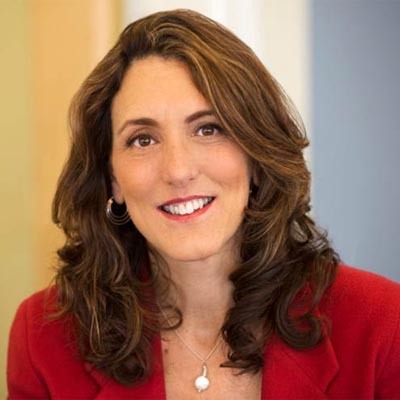 "There are all these barriers to people getting well — like insurance and treatment rules. It's to the point where, for some people, the only treatment options are in institutions like prison," Carvagio said. "That's the only safety net that's catching people. It just further traumatizes them and paradoxically makes it more likely for them to relapse when they get out." Police cars sometimes circle the park when the volunteers are there and a few officers have spoken with the group, but no one has been arrested — yet. "I believe that there is not just like a moral duty to violate unjust laws, but in this circumstance a spiritual duty," Carvagio said. On this day, they gave out 100 syringes, 10 naloxone kits and made one referral to treatment. Bangor police Sgt. Wade Betters knows about the group. He says he would like to sit down and meet with them, but he believes their focus should be on getting people into treatment. "You know, if you're committing a crime in the state of Maine, you could be subject to arrest or ticketed," Betters said. "But in these cases, we use a lot of discretion because the goal is the same — to save lives." Police in Lewiston, Maine, have taken a different position. They've warned the group not to give out clean syringes in a local park because it's against state law. So the group members have arranged to meet with people and bring the supplies to different meeting spots. 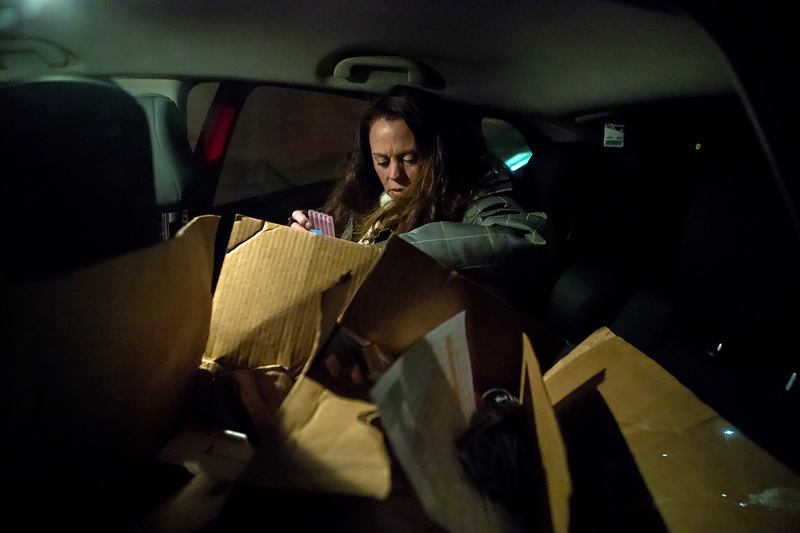 Driving through the city one night, in a car packed full of boxes of syringes and other drug using equipment, Kandice Child met up with two young men standing near a convenience store. "I'm going to give you 100 [syringes]," Child told one of the men. "What about alcohol wipes, you need any of those?" Child gave them naloxone and test strips for the powerful opioid fentanyl. She said she only gives clean needles when someone returns their used ones so as to help keep syringes off the streets. Child said she does this because she has a family member who is struggling. She also says there are only six certified needle exchange programs in Maine, none in Lewiston. "Why wait?" Child asked. "Should we all sit around and talk and point fingers or should we get off our a-- and do something about it? This helps, it works, it saves lives, it reduces HIV, it reduces hepatitis, and it keeps syringes off the streets." Next stop was an apartment where three people were waiting to trade containers filled with used syringes for clean ones. Another volunteer demonstrated how to use naloxone as Child filled out paperwork keeping track of what she's handed out. A 36-year-old man — who didn't want his name used because he's using drugs — was uneasy. He said he's glad to get the clean equipment but he admits he's conflicted about whether getting these supplies makes it easier for him to use drugs. "The only reason I struggle is the inner conflict, you know? It's preventative maintenance yet at the same time it's enabling, you know?" he said. A woman in the apartment, who also didn't want to be identified, chimed in: "I understand, but what are you supposed to do? If someone isn't able or ready to go to treatment — should they die?" she asked. Even the founder of the Church of Safe Injection, Jesse Harvey, 26, admits that he's struggled with the same questions. But he said working in addiction recovery has made him frustrated by the deaths and barriers to treatment. He said there are criteria to becoming a legitimate syringe exchange program that he's not likely to meet, so he started this church. Harvey says there are now 18 chapters of the Church of Safe Injection in eight states — all of them funded by private anonymous donations. One has formed in western Massachusetts. Each one is independent but must abide by three rules: to welcome all people of all faiths, to serve all marginalized people and to support harm reduction. But he said the group is not supporting legalizing drugs. 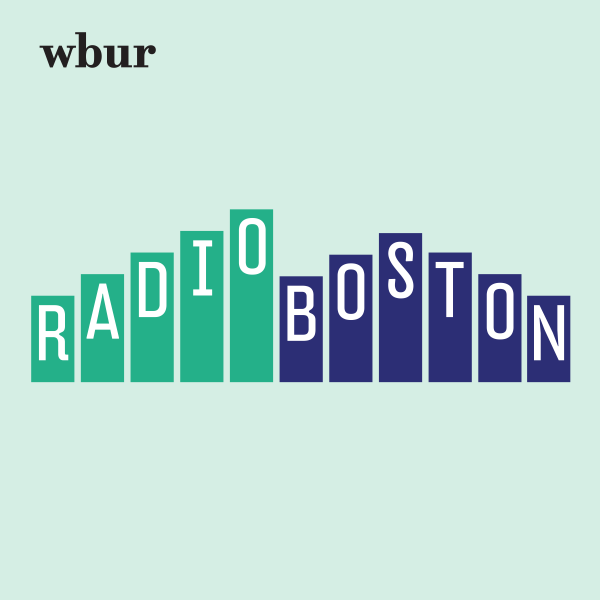 "We're not saying it's our religious belief to use heroin. No, not at all," Harvey said. "We're saying that it's our sincerely held religious belief that people who use drugs don't deserve to die when there are decades of solutions." Harvey plans to register the church as a nonprofit and then argue for a religious exemption from drug laws. He said the Supreme Court has already ruled that a religious group is allowed to use the illegal psychedelic ayahuasca in its religious rituals. "I don't think it's illegal, and if it is, I think we have a religious exemption here," Harvey said. 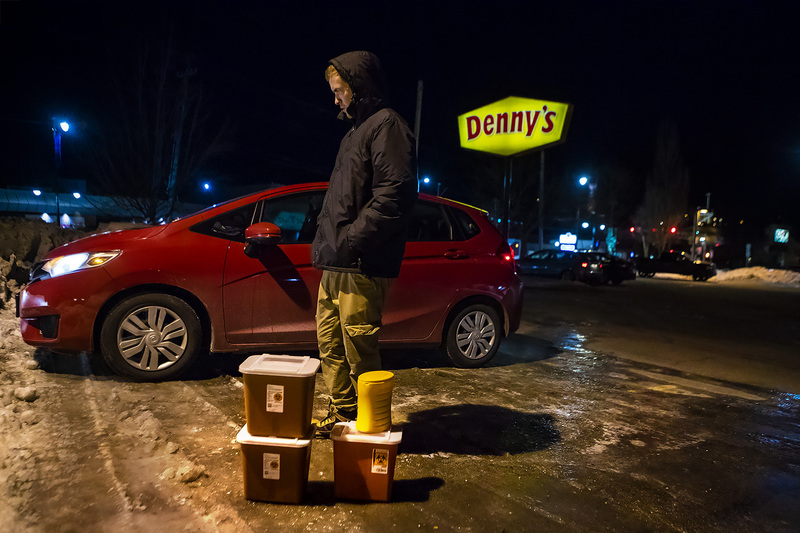 "With the high rate of fatal opioid poisoning in Maine, why criminalize a group of people with lived experience who are trying to save lives? If the state is not going to do something about this, well guess what? We're going to." Harvey said eventually he hopes to have a location for the church that will include a site where people could inject drugs under supervision. 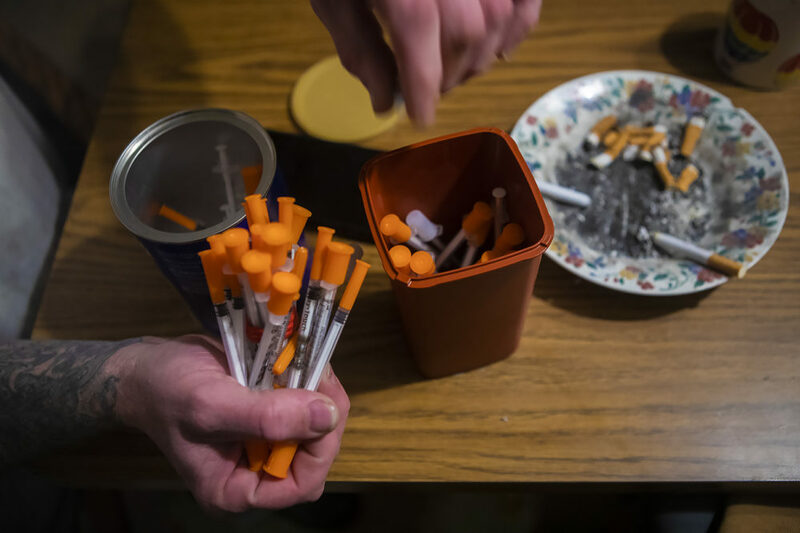 Such "supervised injection sites" are legal in other countries, but Justice Department officials have warned that they will prosecute anyone operating one in the U.S. Nevertheless, several U.S. cities are considering whether to open a site. Harvey said while the debate continues, his congregants will continue to risk arrest and hand out supplies.